I promise to use it only to send you Fingerstyle Report. Correct guitar practice is the only way to advance as a guitarist. Practice can be defined as having a clear cut goal and a plan on how to reach that goal. How do you know what to work on? If you have a good teacher, he/she will be able to guide you. If you're self taught, it's another matter. There are a lot of different resources available for the self-taught guitarist. The biggest factor is finding the right materials. It's important that the material is presented in a way that speaks to you. There are some things that anyone playing fingerstyle guitar should know. They should include exercises for technique, work on chords and music theory and learning songs. Learning technique is obvious. Your fingers have to do what you tell them to do. The guitar chords and theory part gets scary for some people. The trick is to break it down into small pieces. When you put enough small pieces together, you really have something. All of the technique and theory in the world won't do any good if you can't play a song. That's the point,right? Your guitar practice should always include new songs that you're learning. You should also polish the songs that you know. For most of us, it takes a lot of practice to learn a new song. That makes song selection really important. There's nothing worse than working on a new song, just to realize that you don't like it! 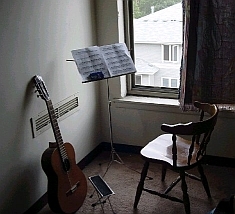 You should set up an area of your living space as a practice area. It's best if it's in a quite area without much traffic. In other words, everything that you need to make the most of your time. It's better to practice 30 minutes a day instead of trying to practice 2 hours 1 day a week. You will learn more and make faster progress that way. Some people feel like they may not have time to practice for 30 minutes a day. Look at it like this. All you have to do is give up one re-run of Laverne and Shirley. Presto! Now you have time to practice. guitar practice schedule will bring results faster than anything else that you do.